Most normal, healthy adult tissues exist in a state of vascular quiescence that is sustained by a combination of influences that include embryonic factors (1), associated cells (2) and an overall balance of angiogenic factors in which inhibitors predominate over inducers (3). 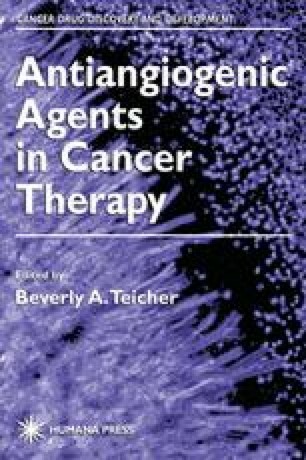 Thrombospondin (TSP) is one of a small number of naturally occurring inhibitors of angiogenesis that is well-positioned to contribute to this maintenance of vascular quiescence in normal tissues, and whose loss in pathologic conditions, particularly cancer, contributes to increased neovascularization. First identified over two decades ago as a secretory product of thrombin-stimulated platelets (4,5) TSP is now known to be secreted by a wide array of cell types, including endothelial, fibroblast, smooth muscle, glial, keratinocyte, and inflammatory cells, and to participate in diverse biological processes, including coagulation, fibrinolysis, neurite outgrowth and nerve regeneration, tumor growth and metastasis, embryonic development, differentiation, inflammation, and angiogenesis (6).